The objective of DPLL shall be to implant firmly in the children of the community the ideals of good sportsmanship, honesty, loyalty, courage and respect for authority, so that they may be well adjusted, stronger and happier children and will grow to be good, decent, healthy and trustworthy citizens. Dos Pueblos Little League was started back in 1974 and has a rich history of teaching kids to love the game of baseball. We welcome all who want to participate. If you live or attend school within the DPLL Boundaries then you may be able to register to play at DPLL. Please read below. The boundary for DPLL is anything West of Kellogg Ave. If you live outside the DPLL boundary but you attend a school within the DPLL boundary, then you may be able to play baseball at DPLL by obtaining a waiver. Schools within the DPLL boundary include Mountain View, Kellogg, Coastline, Montessori Center, Santa Barbara Montessori, La Patera, Brandon, Isla Vista, Ellwood, Santa Barbara Charter, Goleta Valley Junior High and Dos Pueblos High School. Please contact our with any questions about eligibility (including waivers). IMPORTANT NOTE: Example - 3 (three) documents from the same Group (utility bill, cable bill, and bank statement) constitute only 1 (ONE) document. Players who established "residence" or "school attendance" for regular season and/or tournament prior to the 2017-2018 season using the Player Verification Form, and can produce the form with proper proofs and signatures, will be grandfathered and will NOT need to complete a new Player Verification Form. School Attendance Eligibility - A player will be deemed to attend school in the boundaries if: The physical location of the school where they attend classes is within the boundaries established by the local leauge. Note: This excludes home schools, cyber schools, sports-related schools, sports academies, or preschool or after school where a studen participates outside of the primary school the player is enrolled. 1. Original proof of age document (birth certificate) photocopies are not acceptable, if issued by federal, state or provincial registrars of vital statistics in the country in which the Little Leaguer is participating. 3. An original document issued by federal, state or provincial registrars of vital statistics, or local offices thereof, listing the date of birth, with reference to the location and issue date of the original birth certificate, is acceptable. (The original birth certificate referenced must have been filed, recorded, registered or issued within one (1) year of the birth of the child.) Also issued by these agencies are photocopies of the certificate of live birth with the certification also photocopied, including the signature, and include the seal impressed thereon. Such documents are acceptable without “live” signatures, provided the original filed, recorded, registered or issued date of the birth certificate was within one (1) year of the date of birth. 4. For children born abroad of a parent or parents who are U.S. citizens, any official government document issued by a U. S. federal agency or service, is acceptable. For military dependents, Department of Defense identification cards and military hospital certificates are acceptable. These must be originals, not copies, and must refer to a filing, recording, registration, or issue date that is within one (1) year of the birth of the child. 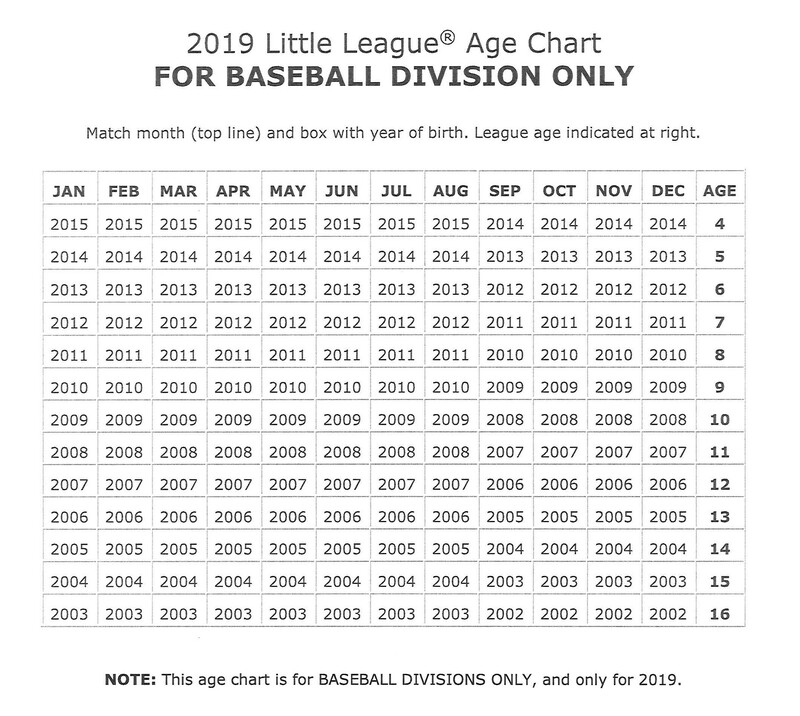 Below is the NEW chart for understanding how your player's age is determined for Little League in 2019. League Age is determined by the player's age as of 8/31 of the upcoming baseball season. There are 7 divisions at DPLL. The placement of your player is determined by age and skill level. We have evaluations to get an understanding of ability and for the managers and coaches to determine which players they will be drafting. Player Age is determined by their age as of 8/31 for the upcoming baseball season. The T-Ball Division is for players starting at 4 years old. The Coast Division is for players who are not ready for kid pitch but need more than T-ball. It is sometimes referred to as "coach pitch." Participants league age 5 and 6 are permitted to advance to Coast after participation in Little League T-Ball for one year. The Farm Division is for players who have basic skills but are not quite ready initially for the Minors. This division will have a pitching machine. The Minors Division is for players who have all the basic stills needed to play at a competitive level. The Majors Division is generally for players who are 11-12 years old. There maybe some 10 year olds who are drafted by a manager due to his high skill level, but this will be the exception and not the rule. The Juniors Division is for 13-15 year olds and play on 90 foot bases. The Challenger Division is for boys and girls, ages 4 and up, with physical, developmental and/or intellectual disabilities.